If you have many applications installed you cannot have them all on your desktop, having them under the start menu can take many steps to launch applications, Fences can help you organize your applications in groups but still can still take up your desktop space. Application launchers can help launch regularly used application right from your desktop with all shortcuts in one place.App.etizer is one such software.It is intelligent enough to identify the folder structure from (apps in “PortableApps” and documents in “Documents”). 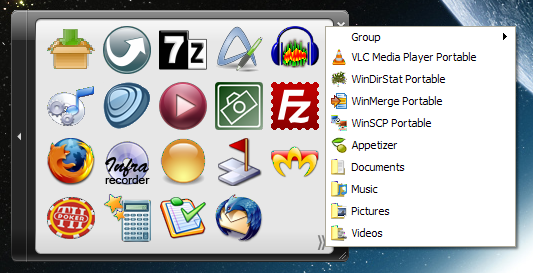 You can use custom icons for applications from with the appetizer dock, and icons can be of 3 sizes Small, large and extra-large.Using the Wizard you can automatically imports shortcuts from various locations like start menu and quick launch. 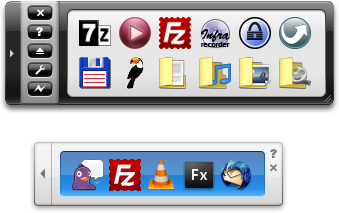 Resizable dock, Arrange icons both horizontally or vertically. There’s also a portable version of Appetizer that you can easily carry along on your USB Drives. Compatible with Windows 2000, XP and Vista.